This acrylic t-shirt holder is a perfect accessory to add to your floor presentation. Display a folded t-shirt in this holder to display the t-shirt design. It measures 13"w x 13 3/4"h. It is available for wall mount, slatwall, or gridwall use. Choose from the options below. 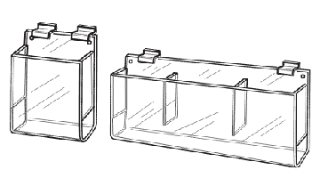 This acrylic brochure holder features 2 brochure pockets and is available for 2 brochure sizes. It is constructed for slatwall display. Choose from the size options below. 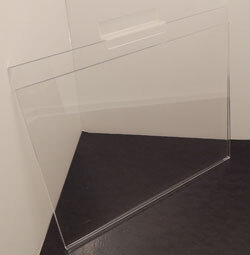 This hosiery bin is constructed of clear acrylic. It features 3 tiers with 2 compartments each, for a total of 6 display compartments. Each compartment is 7 1/2"w. Unit measures 15 3/4" x 11 3/4"d x 11 1/2"h. Slatwall and gridwall display capability is available as well. Choose from the options below. 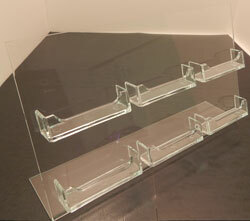 This acrylic business card display stand is a wall mount unit. Display multiple business cards with the option of 6 or 9 business card display options. Also available for slatwall and gridwall. Choose from the options below. 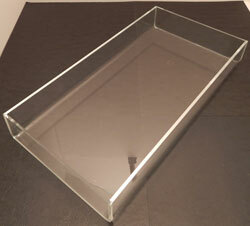 This acrylic brochure holder features 3 tiered pockets. This unit is constructed to be displayed using your slatwall system. Available for 2 brochure sizes. Choose from the size options below.